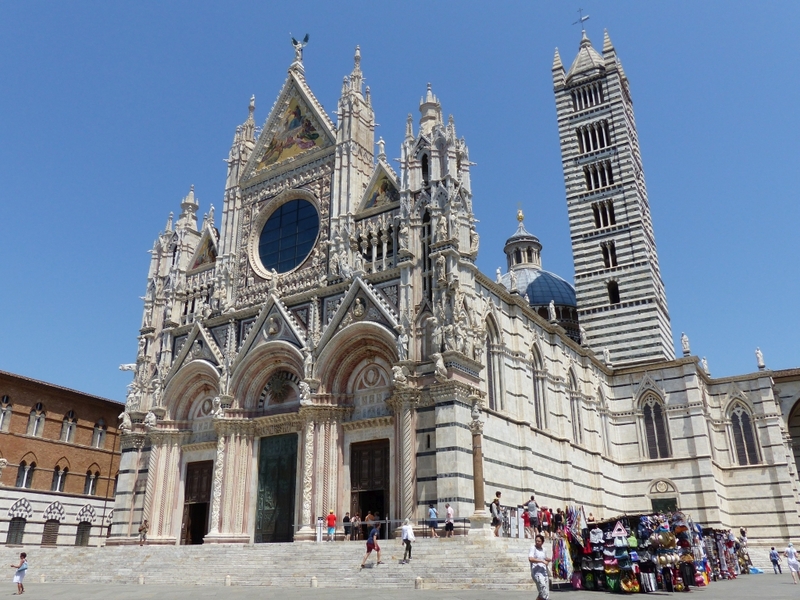 Below you will find a list of pictures, taken on our trip to Tuscany and Umbria in Italy from July 4 to 13 2017. We took the car to Schiphol as the trains would be very crowded as it was the weekend of the Tour de France in the Netherlands. 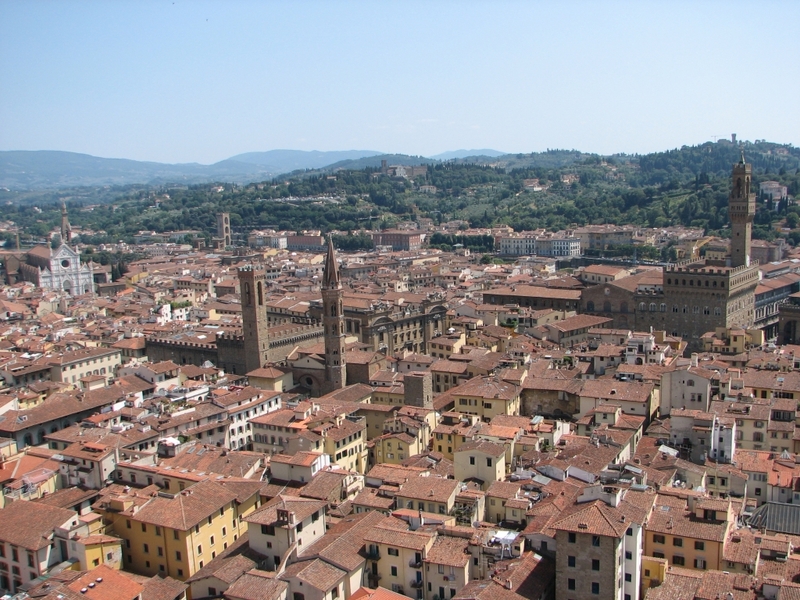 Around 9.35 we boarded and around 11.40 we landed in Florence. 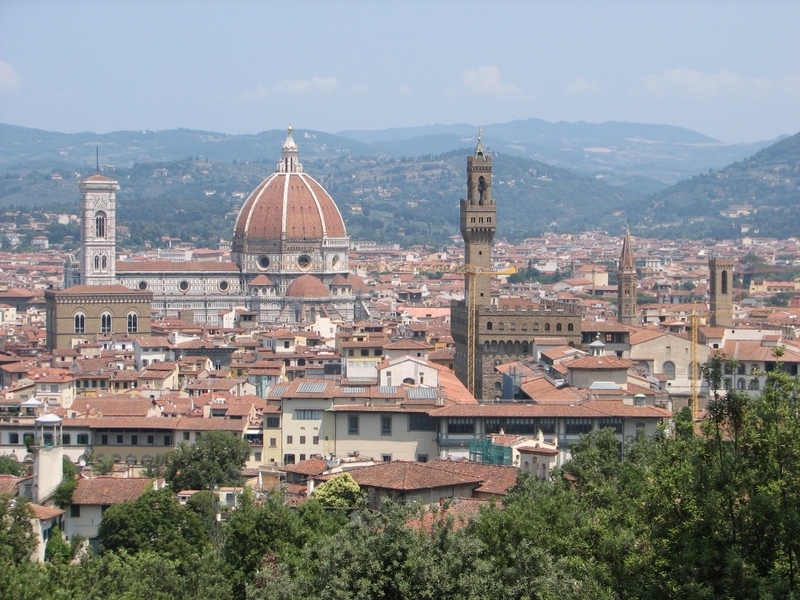 A shuttle bus drove us into the Center of Florence and from there it was onl a short walk to our hotel. We unpacked and then quickly went into the old city. Amazing we were already there at lunchtime. The whole center is an outdoor museum it seems. 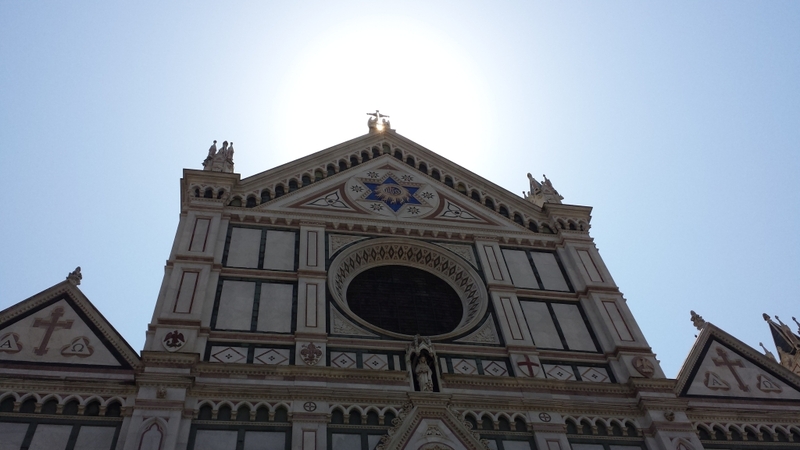 Our first stop was the Cathedral Santa Maria del Fiore with its famous dome (Duomo). 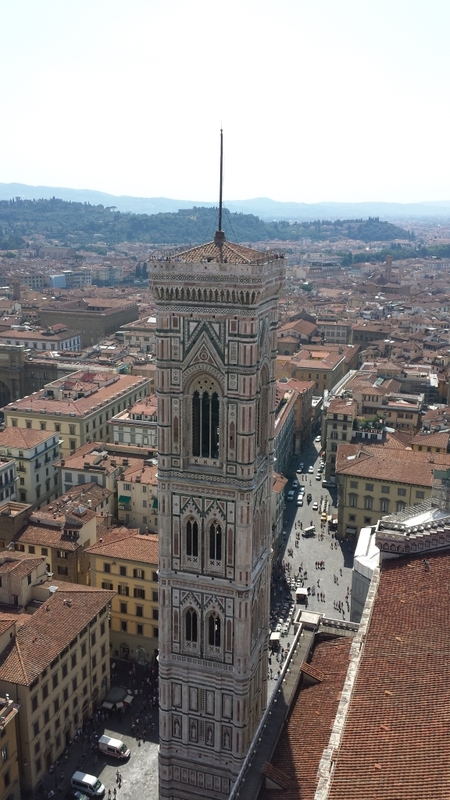 Next we went up the bell tower (Campanile di Giotto, 418 stairs) and up the Cuopolo del Brunelleschi, the actual dome itself. 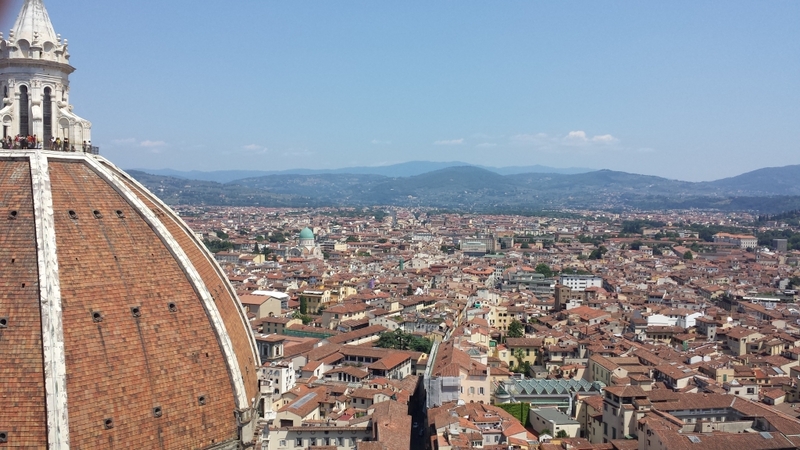 As with the bell tower, this provides a wonderful view of the city. We had icecream at Grom. The best ice I've ever had. 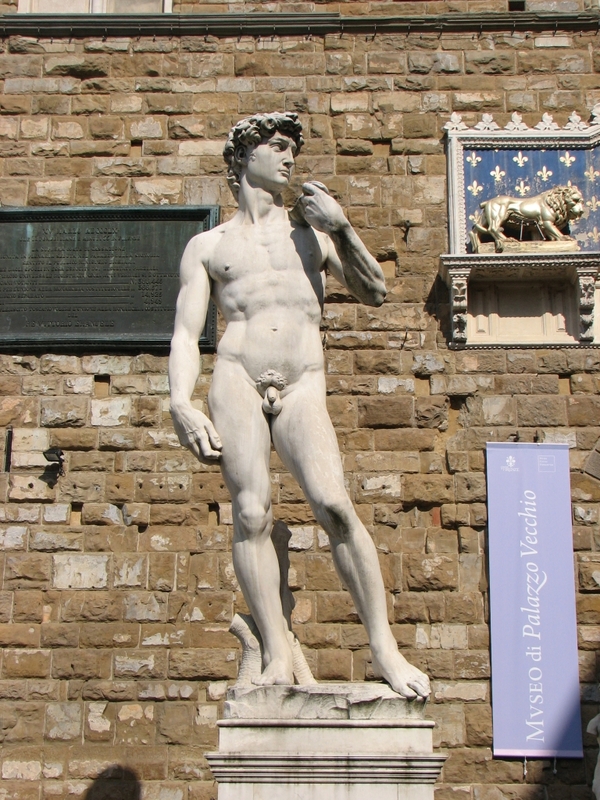 Then we visited the Piazza del Signoria with its many statues (replicas though) and the Palazza Vecchio. 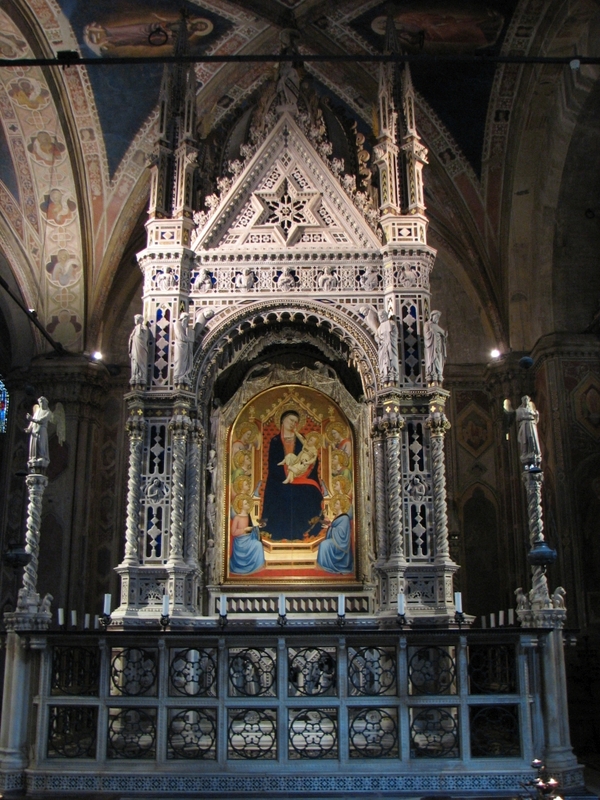 Next stop was the Orsanmichela church with its beautiful altar. 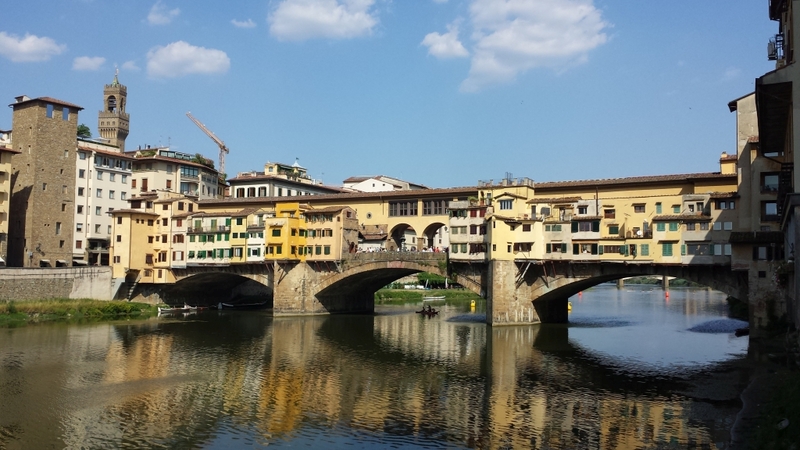 Then we went to the famous Ponte Vecchio. From there back to the hotel. On the way we bought water and fruit. Around 7.30 we went for dinner - pizza and house wine at la Bussola. Afterwards we went to see the Ponte Vecchio in the evening light and again to the Piazza del Duomo. After another ice cream at Grom we returned to the hotel around 11pm. We didn't get up before 9.30. Went to get some roles for breakfast in the nearby super market. 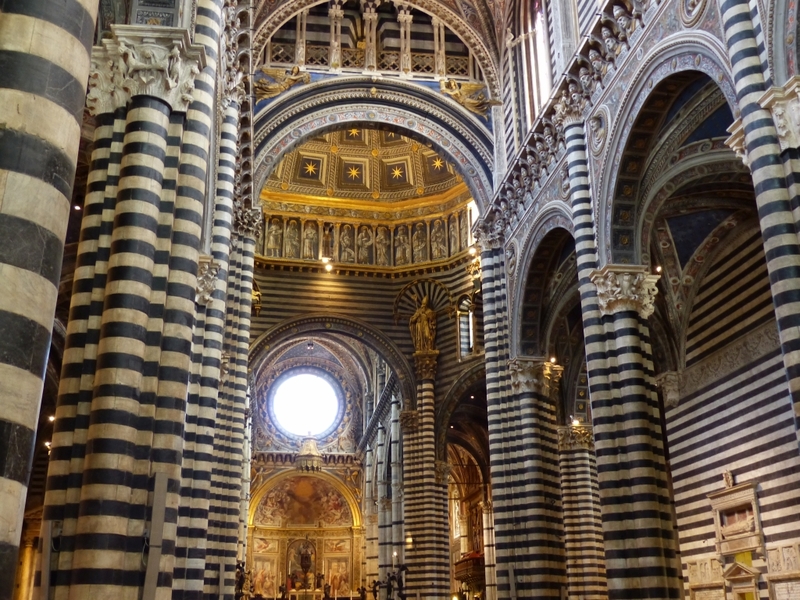 Around 11am we went to the Battistero. 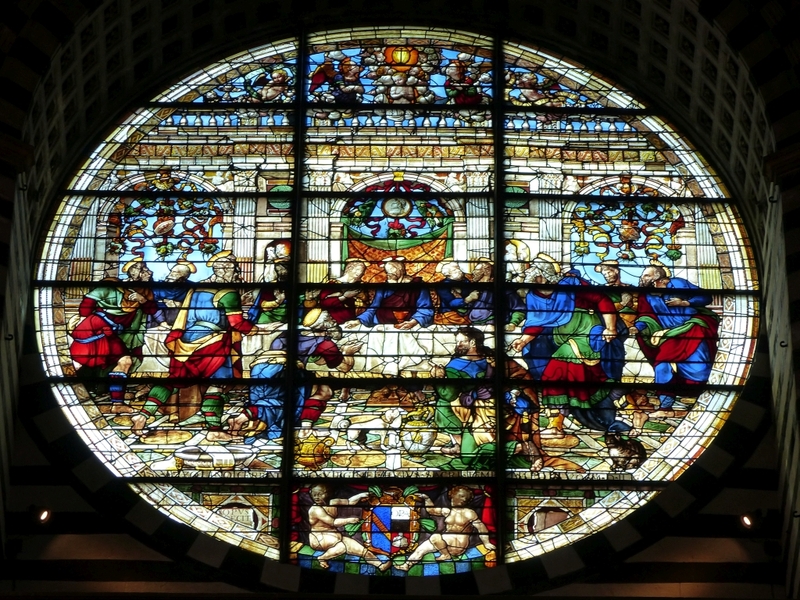 Wonderful stained glass windows and a mosaic ceiling. 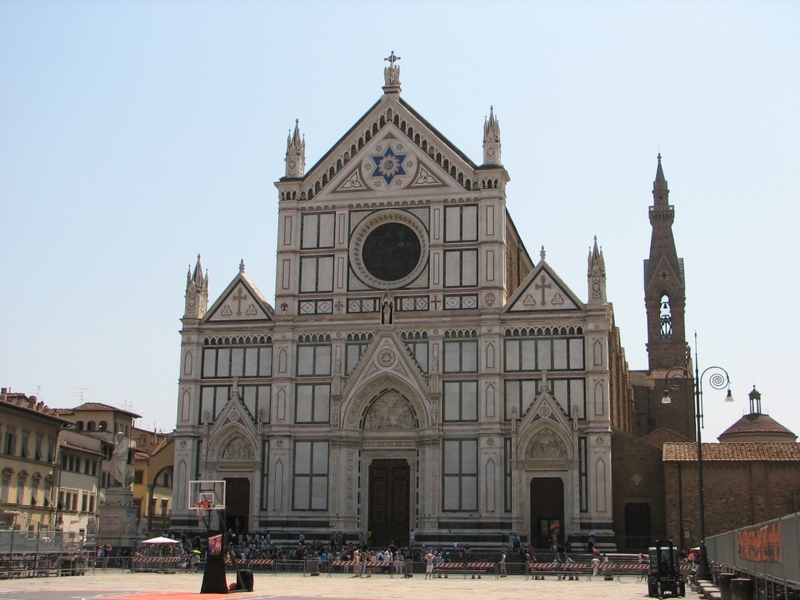 From there we walked to the Basilica di Santa Croce. On the way we stopped for an espresso (first real Italian espresso) and iced tea (very sweet). Via the Ponte Grazie we crossed the Arno en walked up to the Forte Belvedere which gave a beautiful view over the city. Via the Ponte Vecchio we walked to Chiesa San Lorenzo and the the Piazza del Duomo. In the Mercato Centrale (unfortunately the market is closed on Sundays, only the restaurants are open) we had a beer and planned our route for the next day and from there to our 3rd hotel. Back in the hotel we had sodas and took a shower. We went for dinner at Cipolla Rossa. 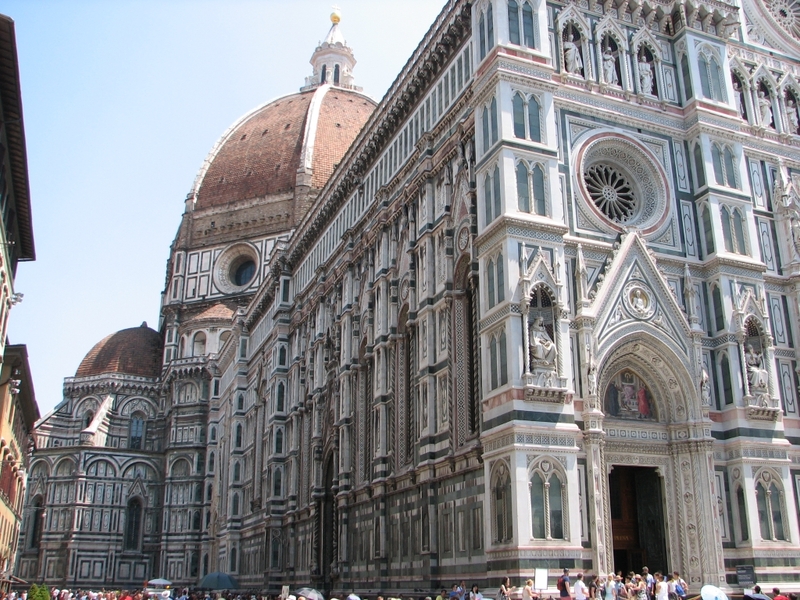 After a short stroll to the Piazza del Duomo we returned to the hotel. After breakfast in a restaurant (the supermarket would not open before 8.30) we got our bags form the room and checked out. We took the shuttle bus to the airport and from the a shuttle bus to the car rental area. Around 11 we could start driving our Lancia Ypsilon. 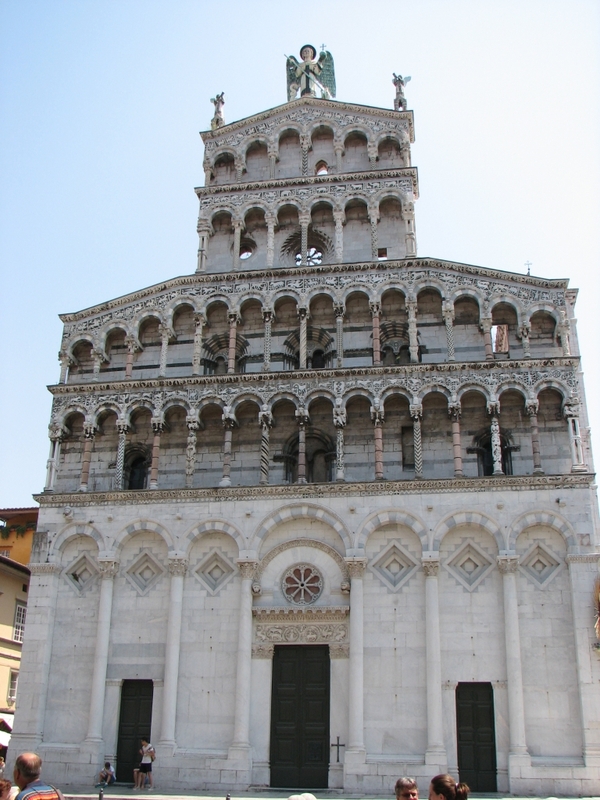 We entered our route in the navigation app on our tablet: Via Pistoia to San Marcello Pistoiese. 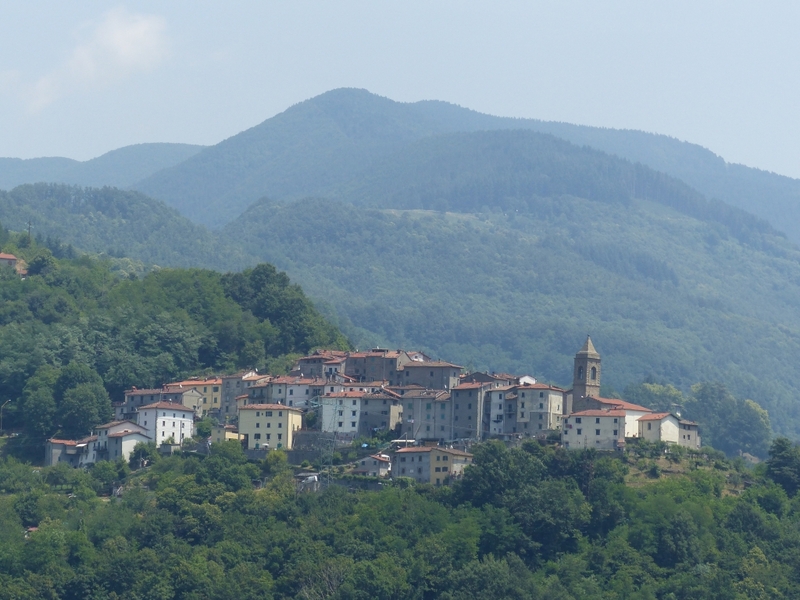 There we bought lunch and continued via Bagni di Lucca and Altopascio to Santa Maria a Monte. As we could not check in until 4pm, we drove to the town centerto get some ice cream and buy groceries at the supermarket. Our apartment had a refrigerator so we could buy things for breakfast too. 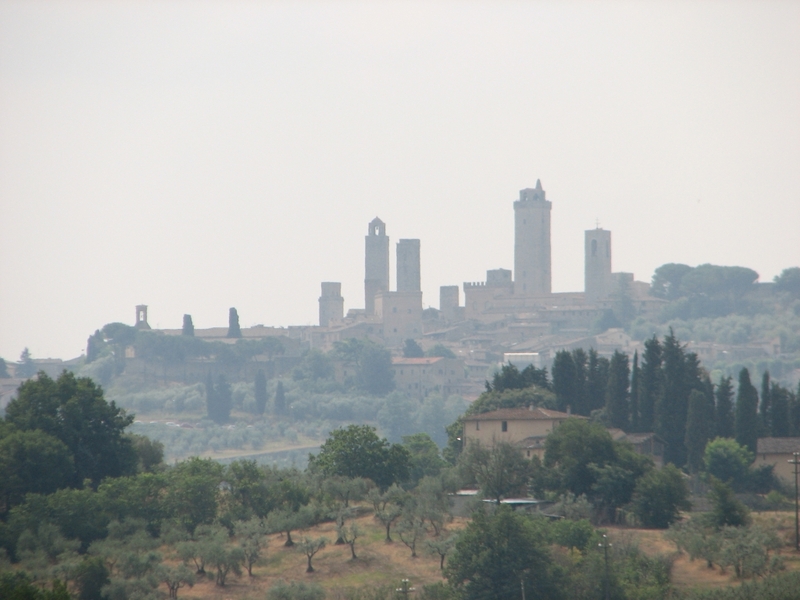 We then drove to our hotel Fortezza di Pozzo. The apartmen was split-level. Above the bedroom and downstairs the kitchen and a couch and chairs. We wnated to go to a local pizzaria but as parking proved impossible in the town, we went to the supermarket to make our own dinner: bread, ham, gorgonzola and some other blue cheese, olives and a bottle of wine. After dinner we planned the route for the enxt day and went to bed. After a late breakfast we drove off to Lucca around 10.20. We parked near the San Pietro gate. Parking is cheap here compared to the Netherlands. Only 5 euro for a full day ticket. 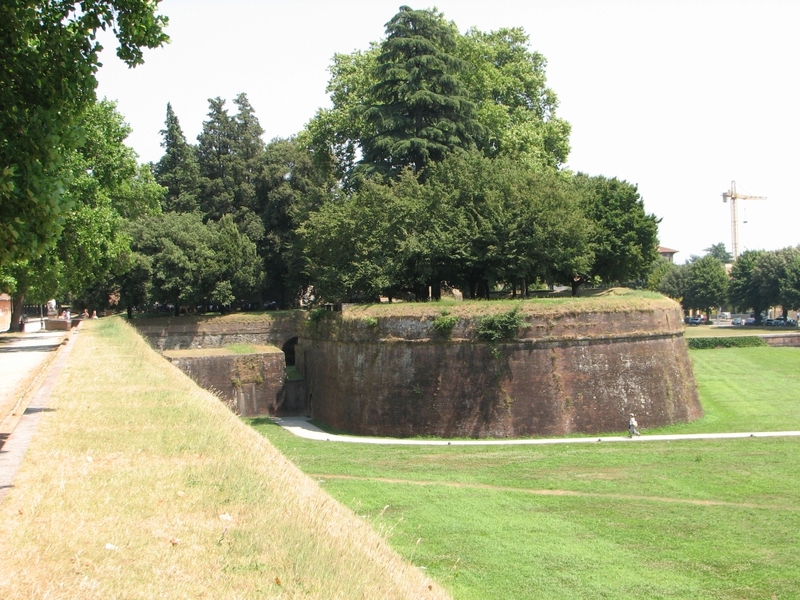 By 11.15 we walked through the gate into the old city of Lucca. We had planned a route beforehand. 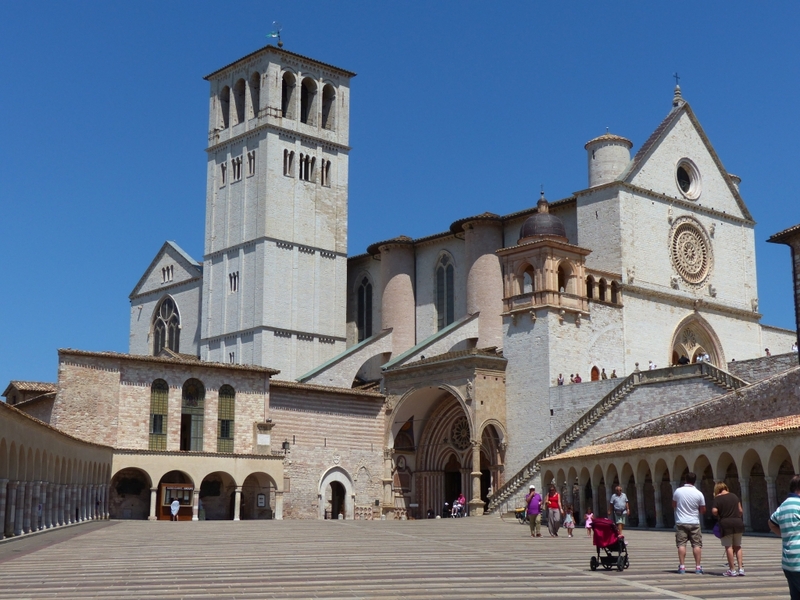 First stop after the gate was the square in front of the San Giovanni church. 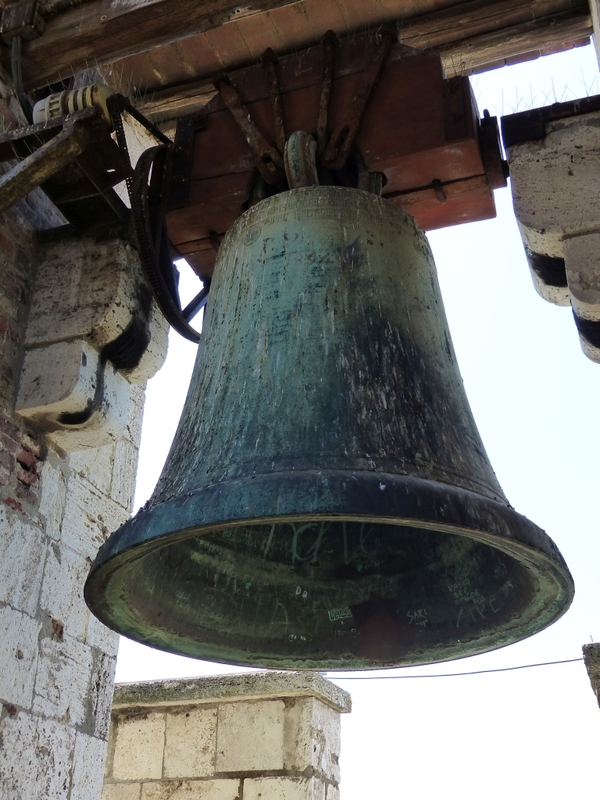 We climbed the bell tower for a view of the city and then went underground into the ruins from centuries past. 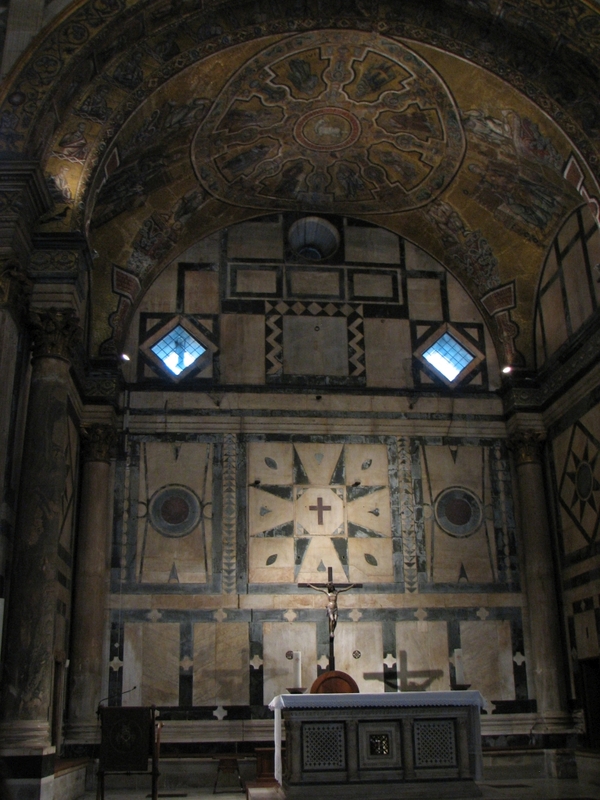 All kinds of mosaics and pillars could be seen there from various centuries. 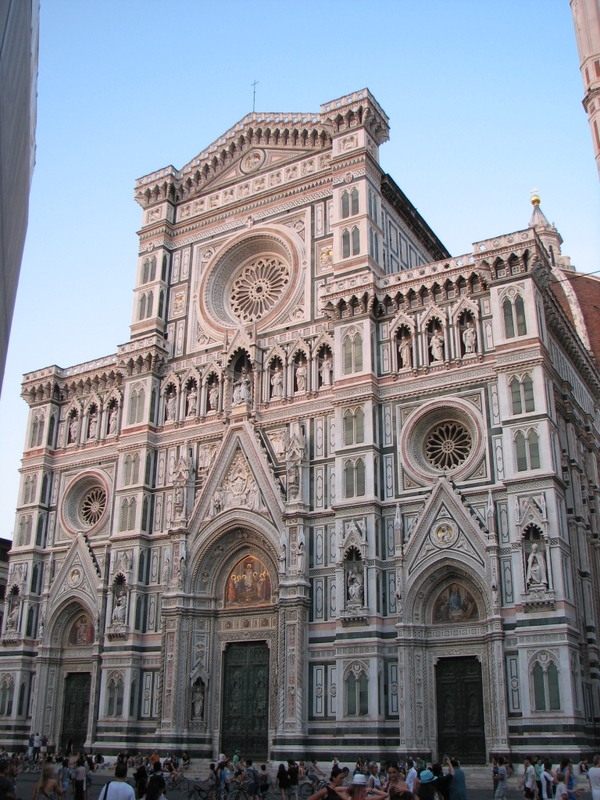 Next we went to the Duomo / Cathedral San Martino. 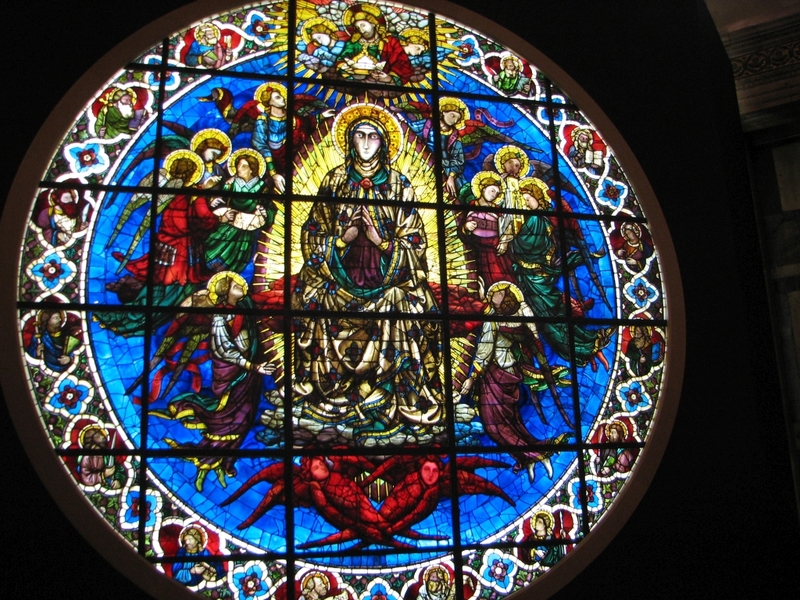 It has many beautiful paintings and stained glass windows. 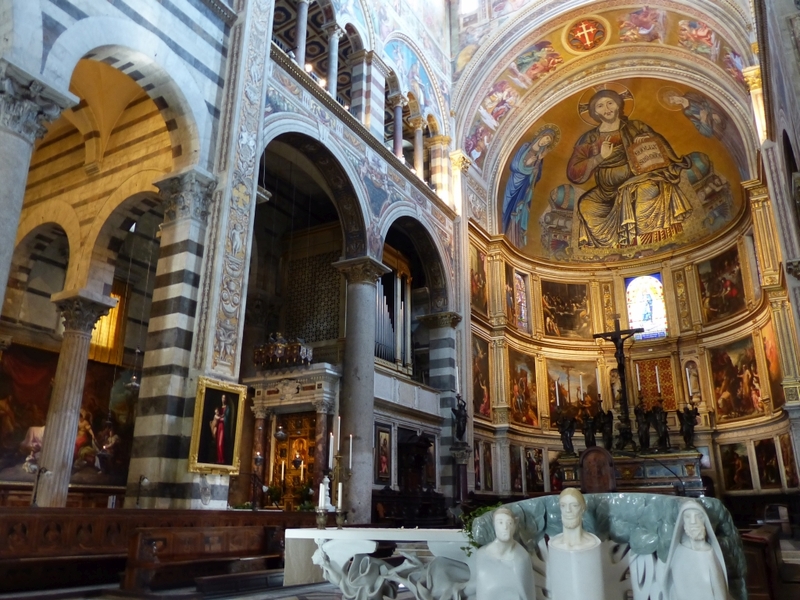 We walked around the Piazza Anfiteatro and lastly went to the Chiesa San Michele in Foro. We had lunch on the square next to it. Back at the San Pietro gate we started the walk along the old wall and after completing that, we went back to the car. Again we didn't take the toll highway, but an inner road through many lovely villages. We also passed an old aquaduct: Aquadotto del Nottolini. 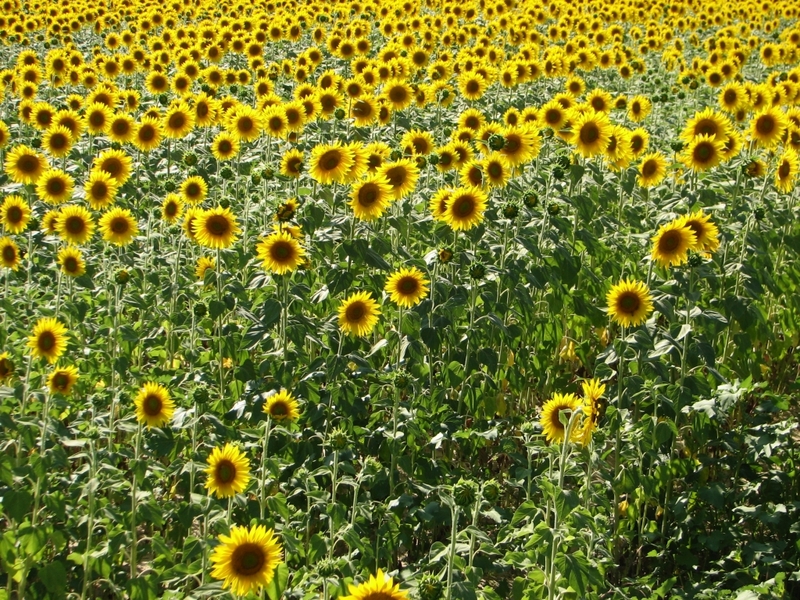 And we saw many fields of sunflowers. After a stop at the supermarket we drove back to the hotel. We had a swim in the pool and a beer sitting next to the pool. After a shower we had dinner in our appartment again: leftovers of the day before with some additional salad and wine. We also planned the route for the next day. 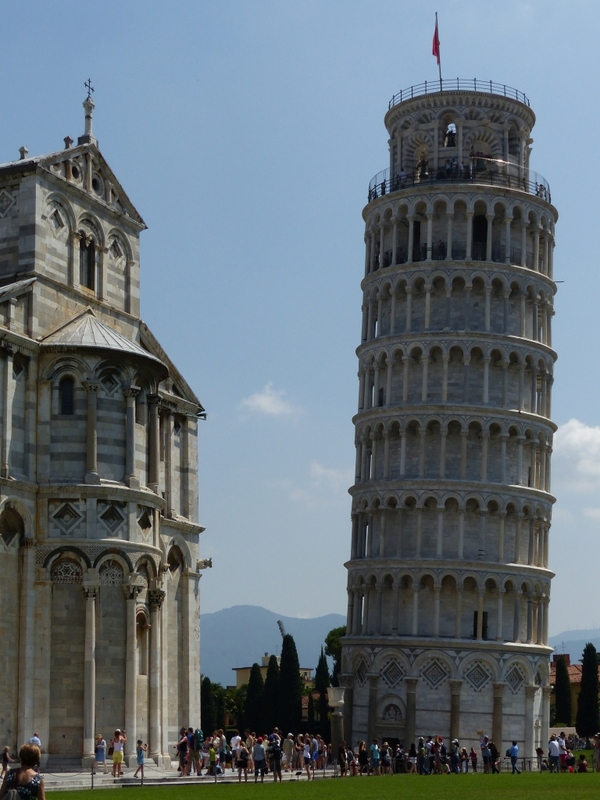 We left around 10.15 for Pisa. 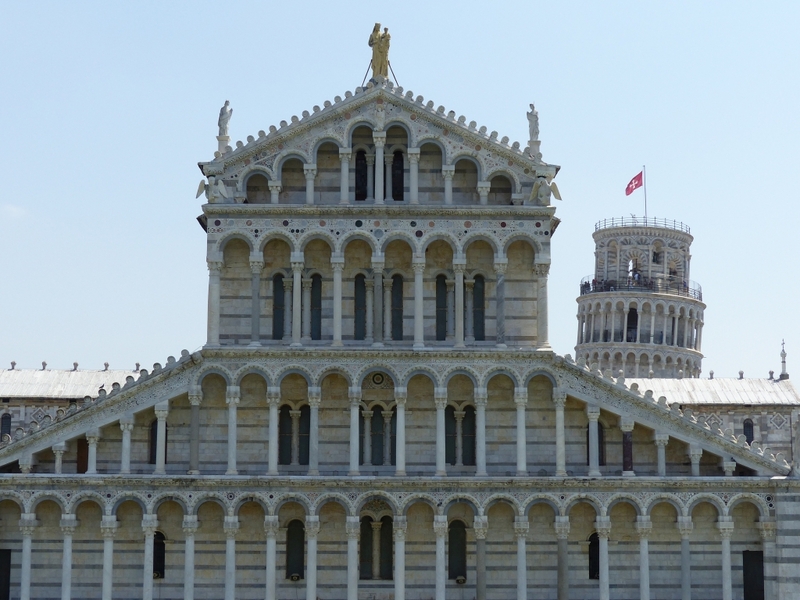 The last stretch was quite busy; Pisa is obviously a tourist magnet. We decided to park a bit further from the famous buildings so we could see some more of the city itself. 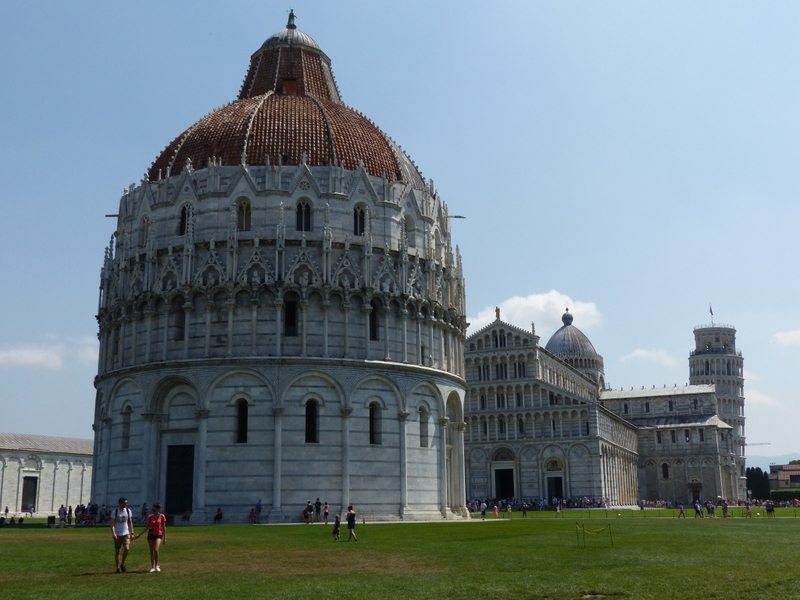 First we went to the Campo dei Miracoli (square of the miracles). 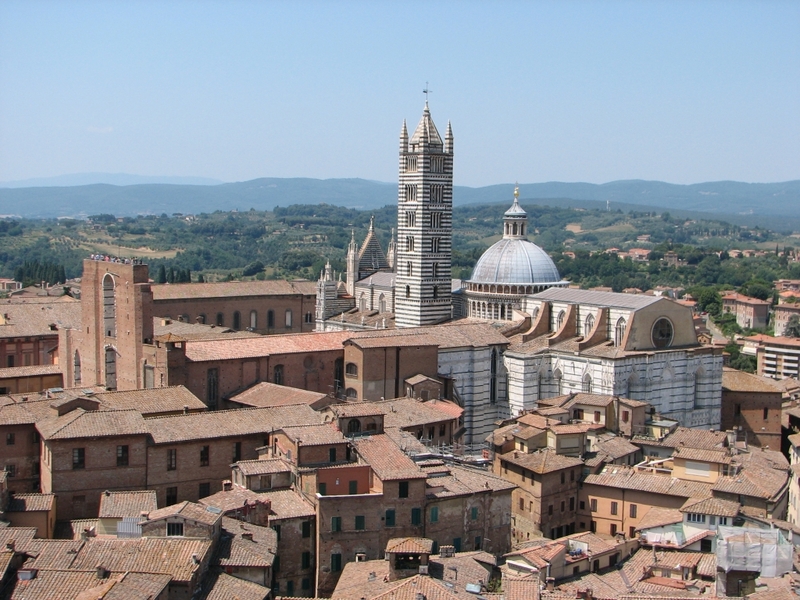 Here you find the leaning tower, the Duomo, the Battistero and the Campo Santo, an old burrial ground. We didn't go up the tower as it was way too expensive in our opinion. 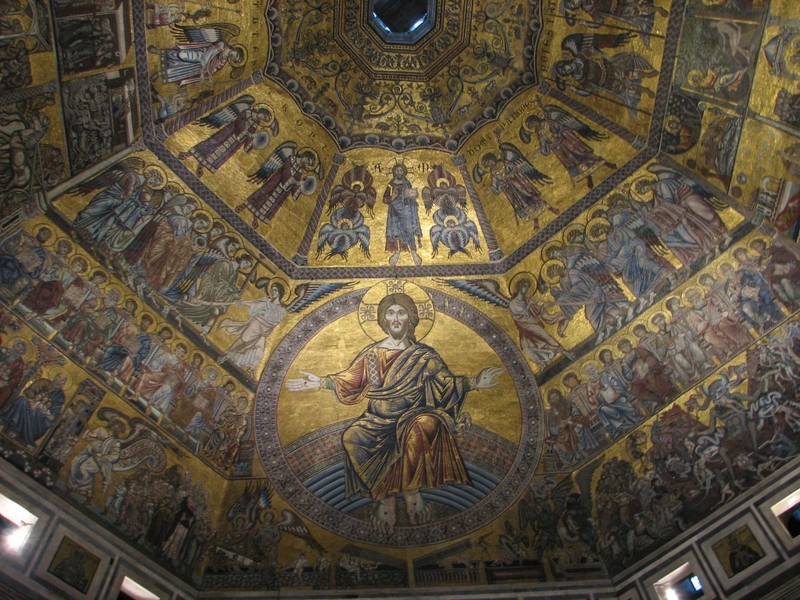 The Duomo is a fantastic piece of art. From the square we walked through the old city. We had lunch and then decided to drive back. We had breakfast and then checked out. We received a bottle of the local white wine and a booklet on the Fortezza. Like most days, we decided not to take the highway, but drive the inner roads. 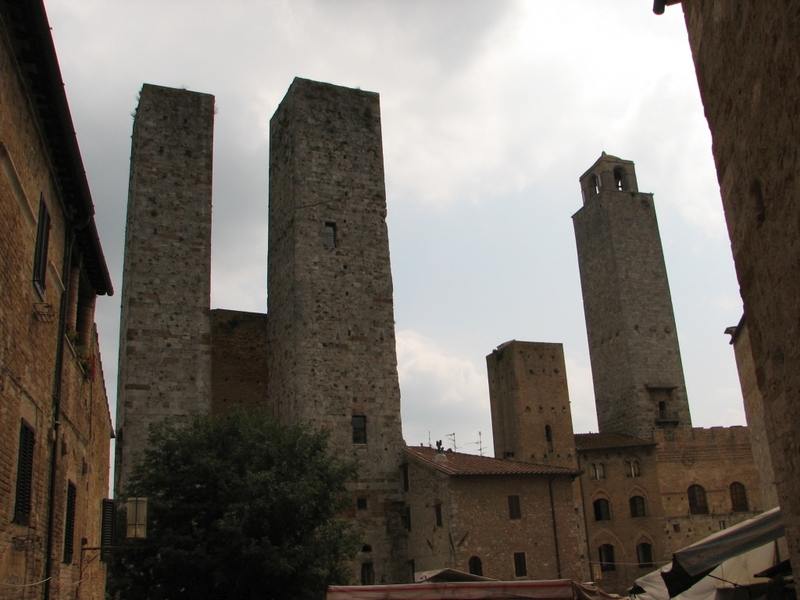 Via Corrazano and Il Castagno we reached San Gimignano. A lovely little town, famous for its chimeys. There we walked to the market square in front of the cathedral. 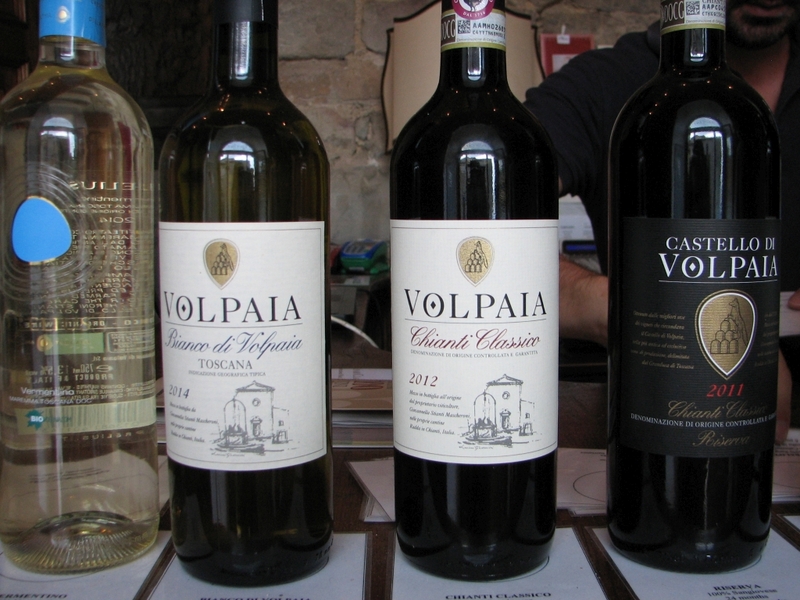 Next we drove through Poggibonsi, Castellina in Chianti and Radda in Chianti to Volpaia where we did a wine tasting. By 2.30 we started driving again, to the last stop of the s=day: our 3rd hotel. 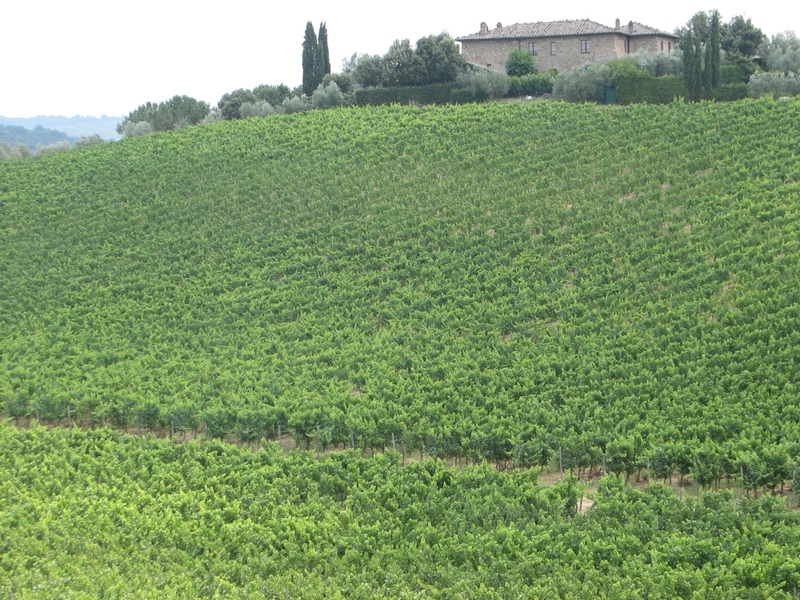 We left the Chianti region and Tuscany and entered Umbria in Arrezzo. 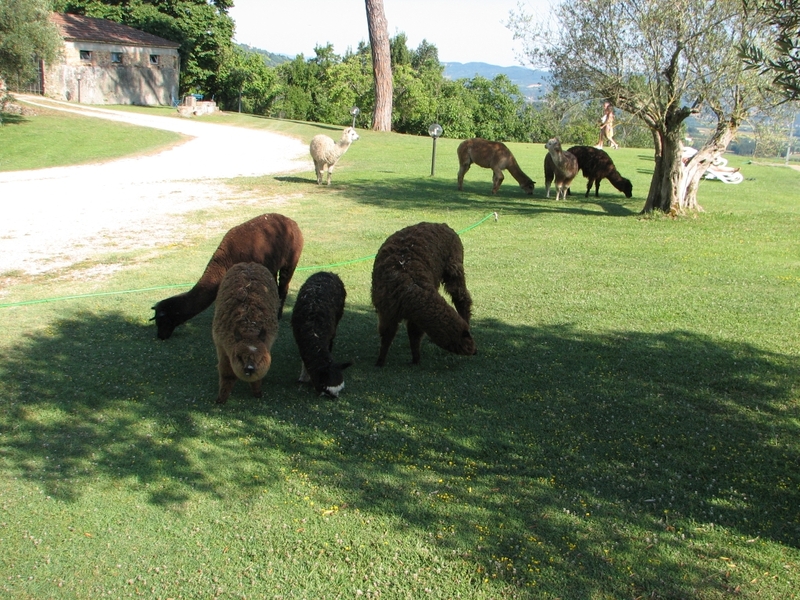 We reached La Casa Paterna in Monte Santa Maria Tiberina where we saw a herd of... Alpaca. 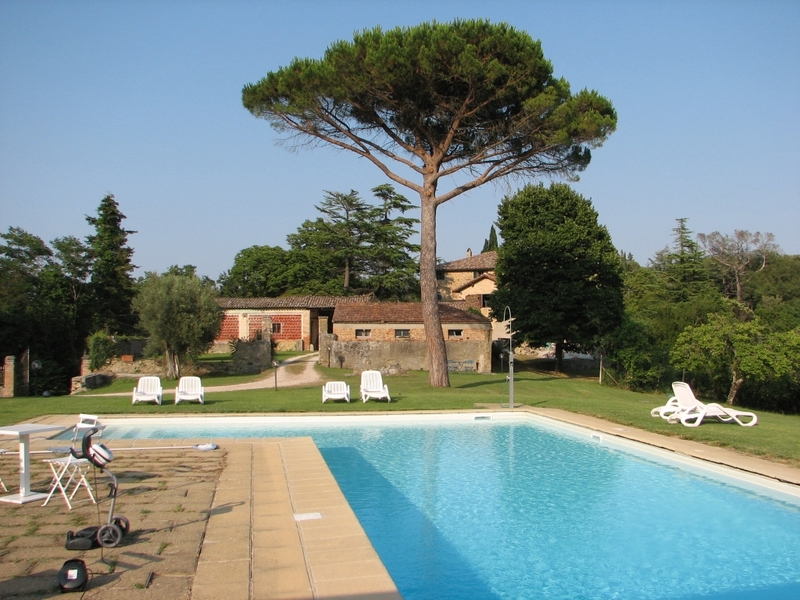 The hotel is a huge house with a couple of rooms for guests. 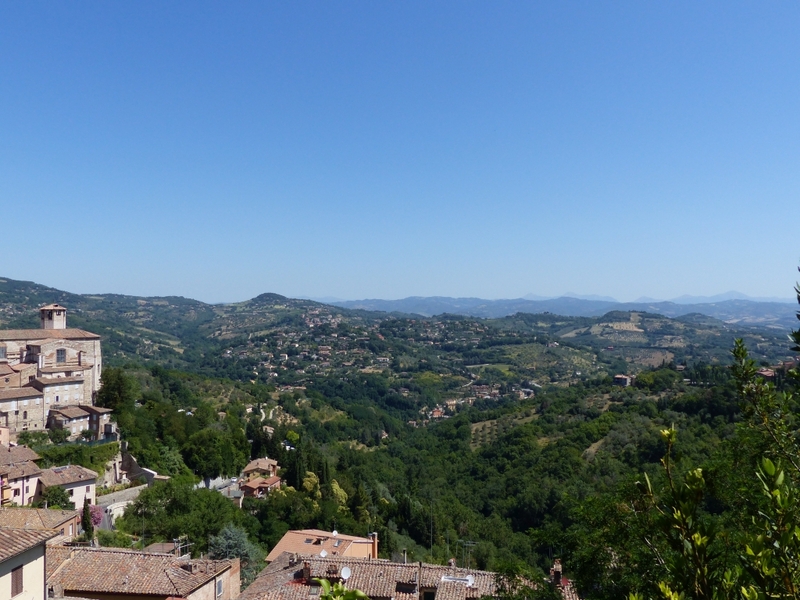 After freshing up we drove to Citta di Castello for dinner. As it is a nice tow, we decided to go for a walk first. We had dinner close to the cathedral and then drove back. 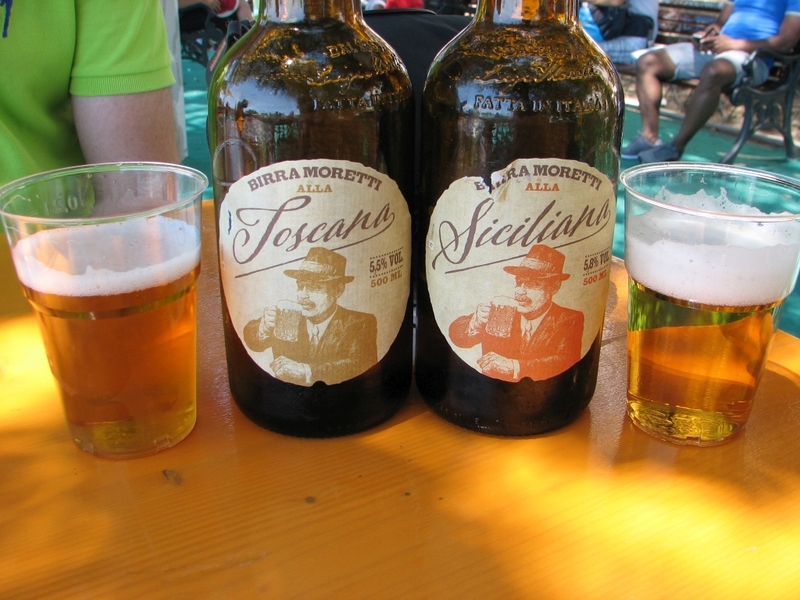 While enjoying a local beer we planned the route for the next day. We ha d a wonderful breakfast with fresh bread and cake baked by our host. Around 9.45 we started driving. 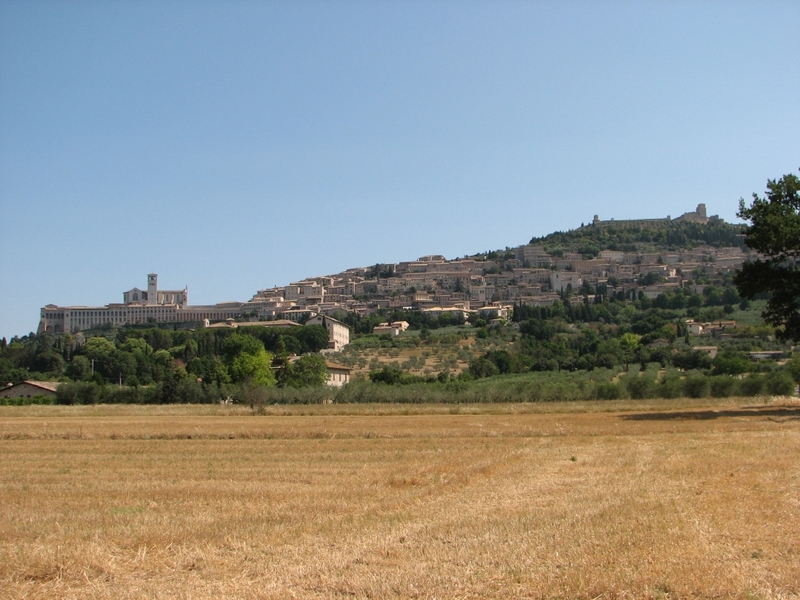 First stop was Assisi which we reached around 10.40. 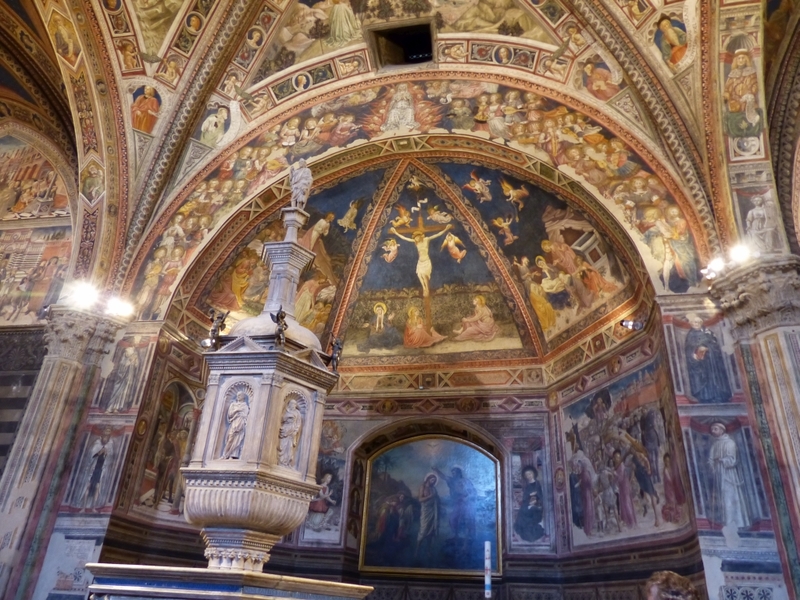 We started our tour of the city at the Basilica di Santa Chiara, which has a beautiful crypt. 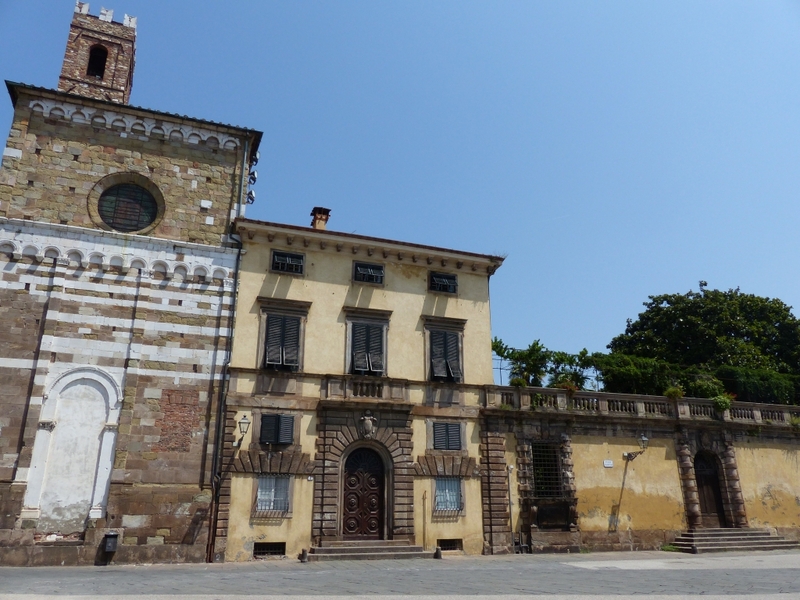 Next we visited the Cathedrale di San Ruffine and the museum (Museo Diocesano) that is two stories below it. Via the Piazza del Comune we went to the Basilica Papale di San Francesco d'Assisi. 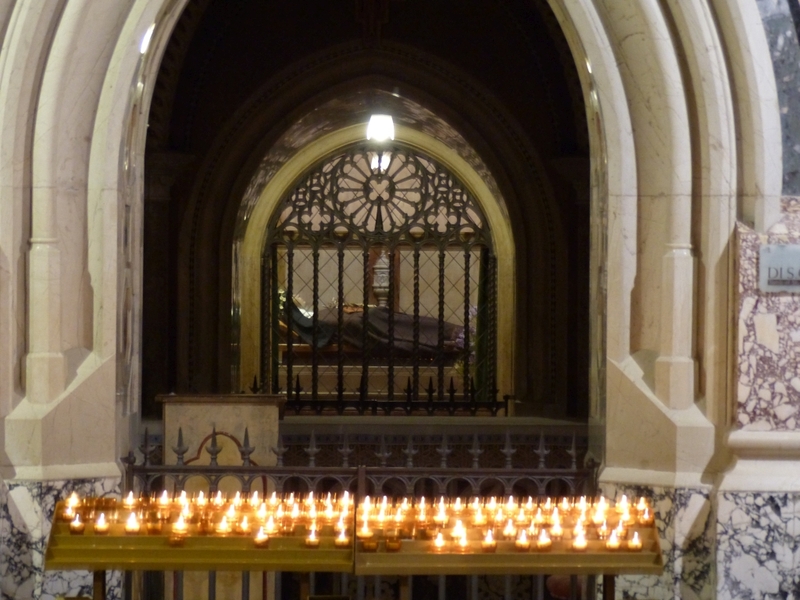 We visited the Chiesa Inferiore, the crypt, the relic room and the Chiesa Superiore. 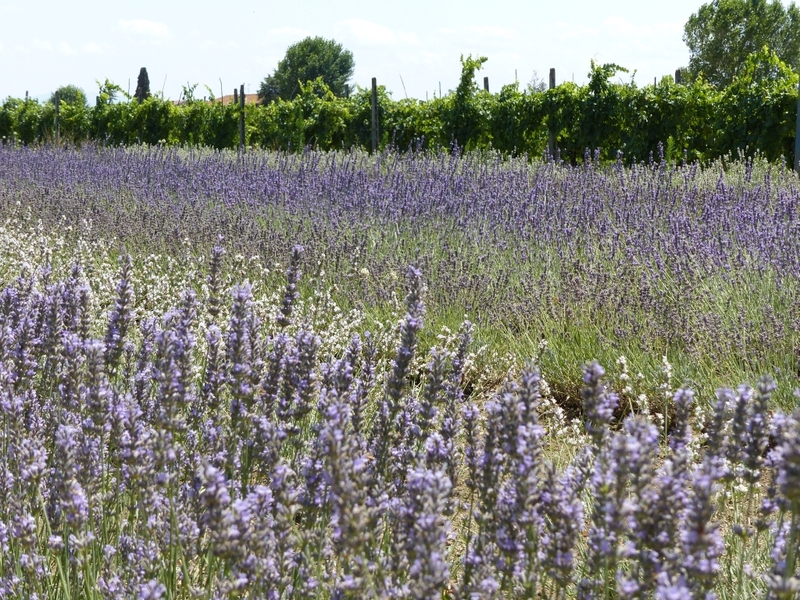 We walked back to the car and had a quick lunchbefore driving to the lavender fields near Castelnuovo. I had expected much larger fields. 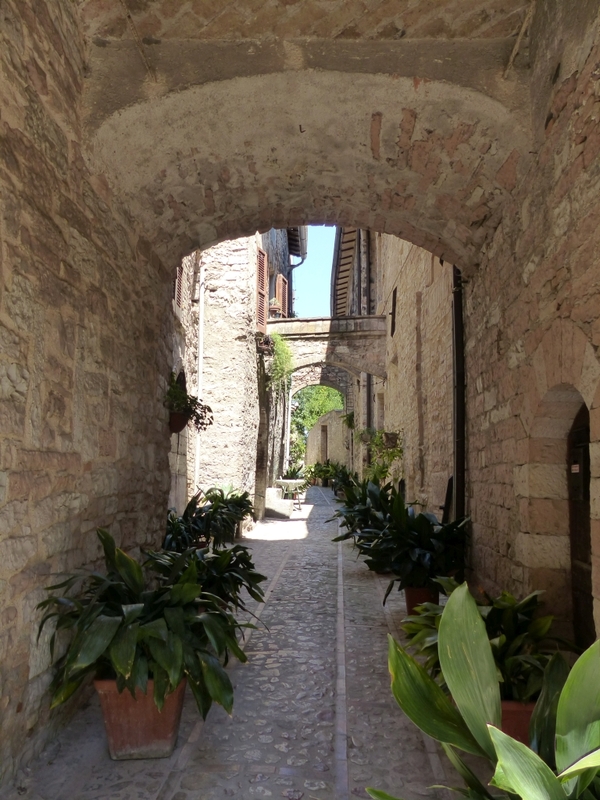 Next we drove to Spello, a tiny town with many lovely alleys. 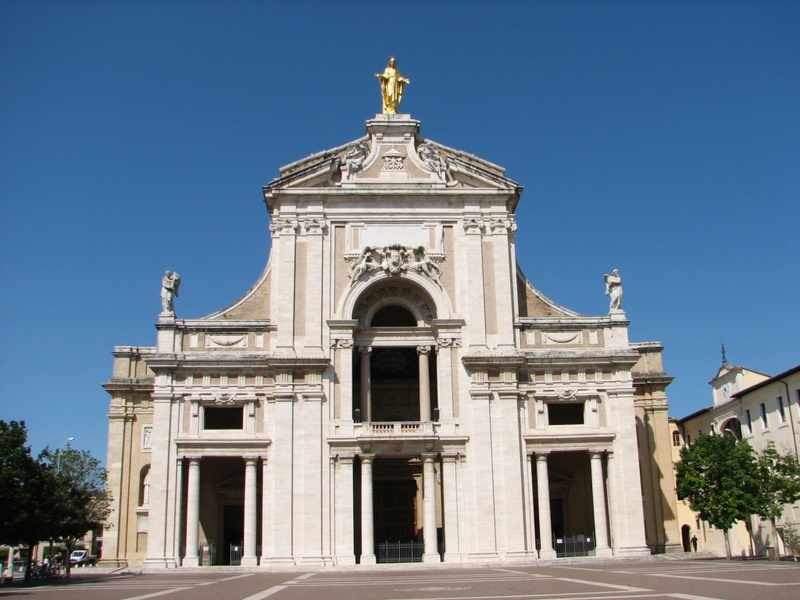 After an ice cream we drove to Santa Maria degli Angeli. 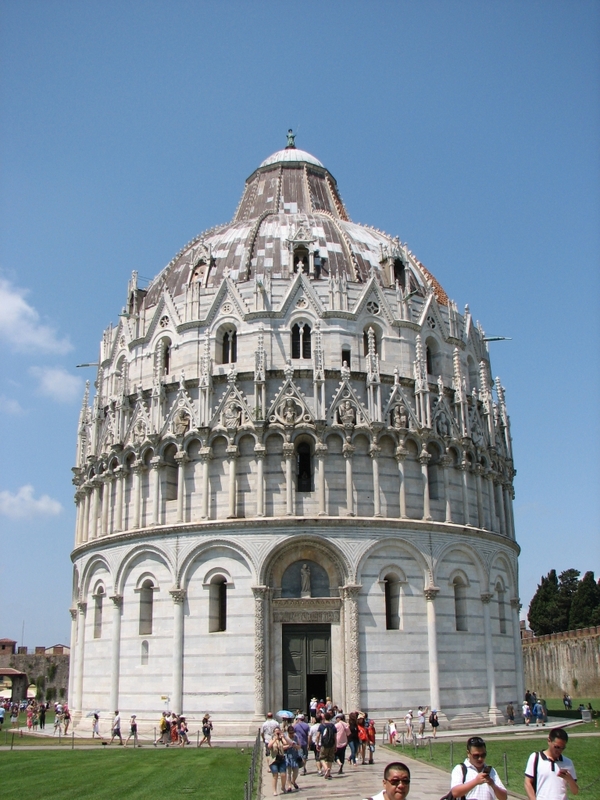 A very impressive basilic built around a tiny 9th century church where Saint Francis used to pray. Next we drove back to the hotel for a swim. 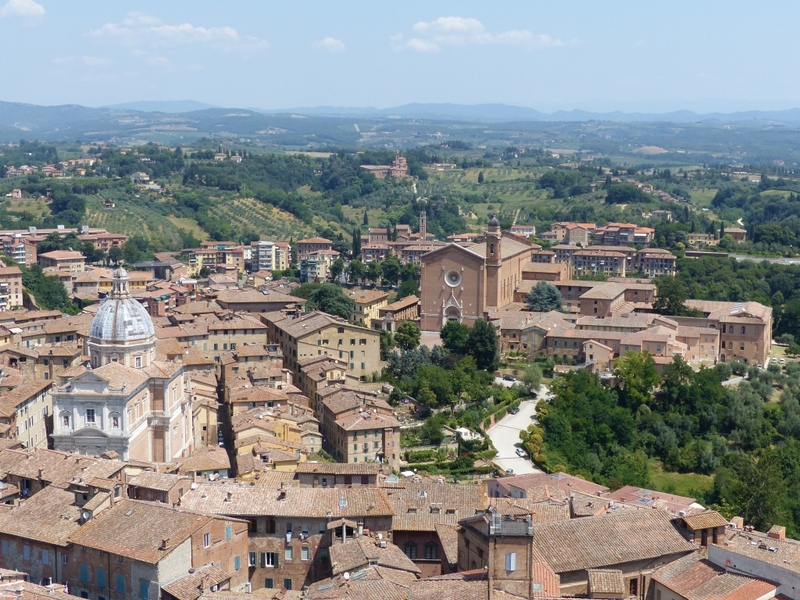 We made plans for the next day and decided to go to Perugia. We had toast and ham with olives and the red wine we bought in Volpaia. The owner brought us a muffin and coffee (for Arjen) and a Grappa (for both of us). 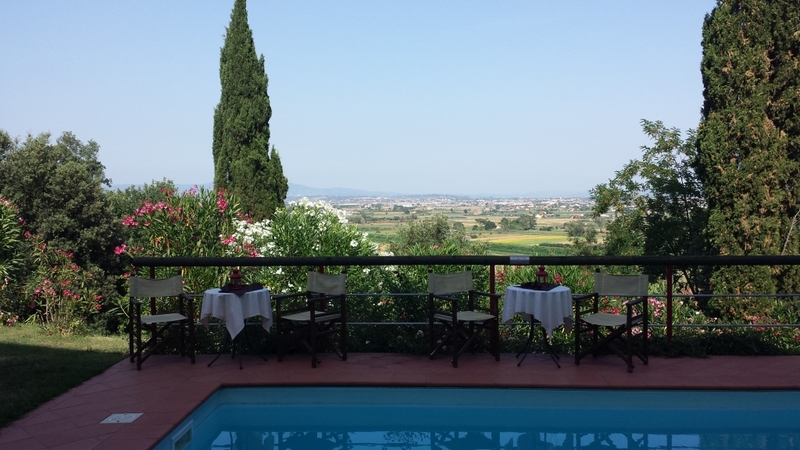 After what was again a lovely breakfast, we left for Perugia around 9.45. We had heard from Rebecca that there was a parking area outside the city (near the minimetro) where you could take a metro up to the old town. that took just 10 minutes and it leaves every minute. By 11 we were in the old town. 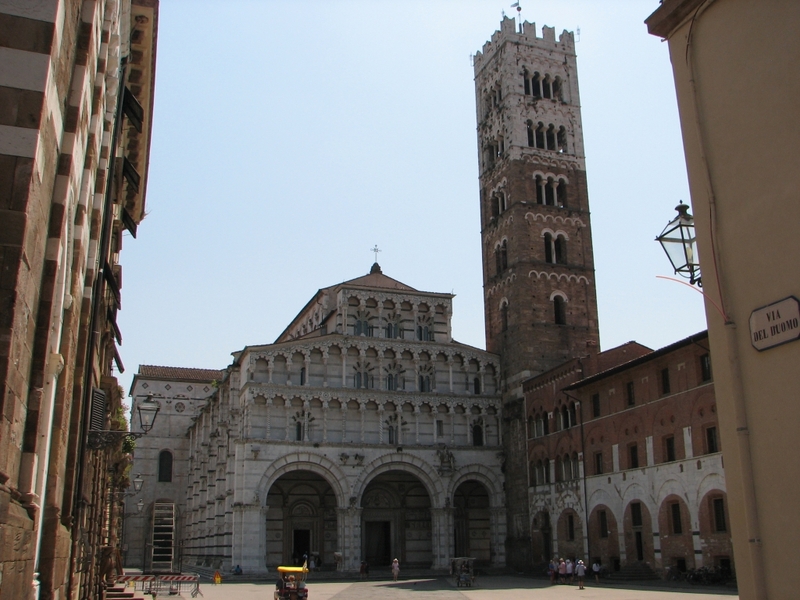 First we visited the Piazza IV Novembre. 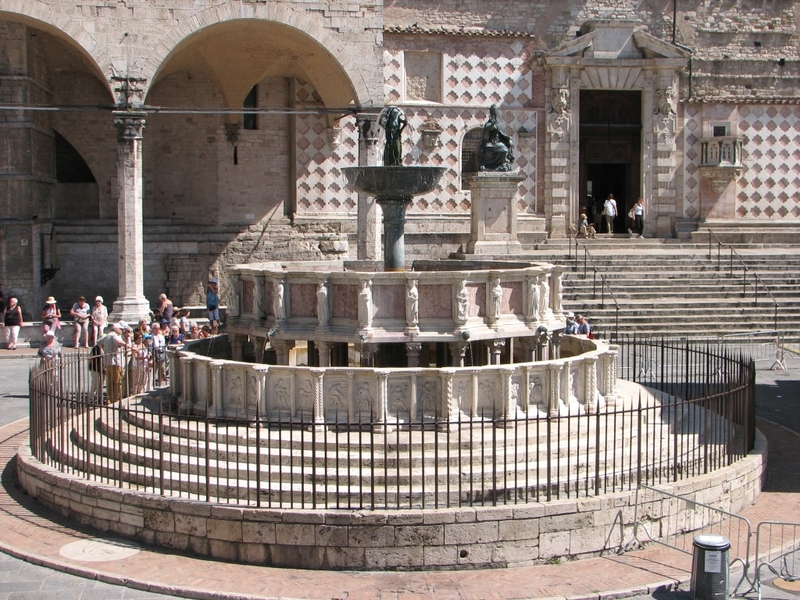 It has a nice fountain and the Palazzo dei Fiori. 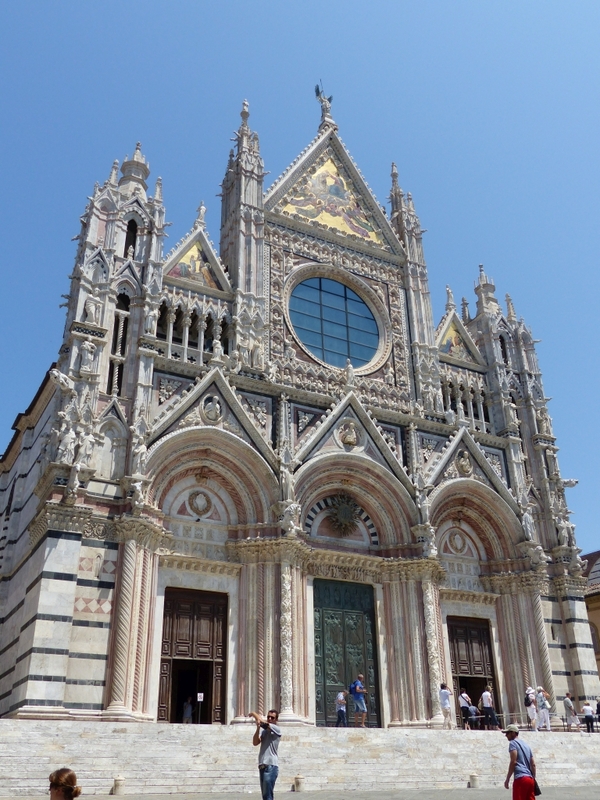 Then we walked to the Duomo (our Lonely Planet says it was a disappointment, but we liked it). 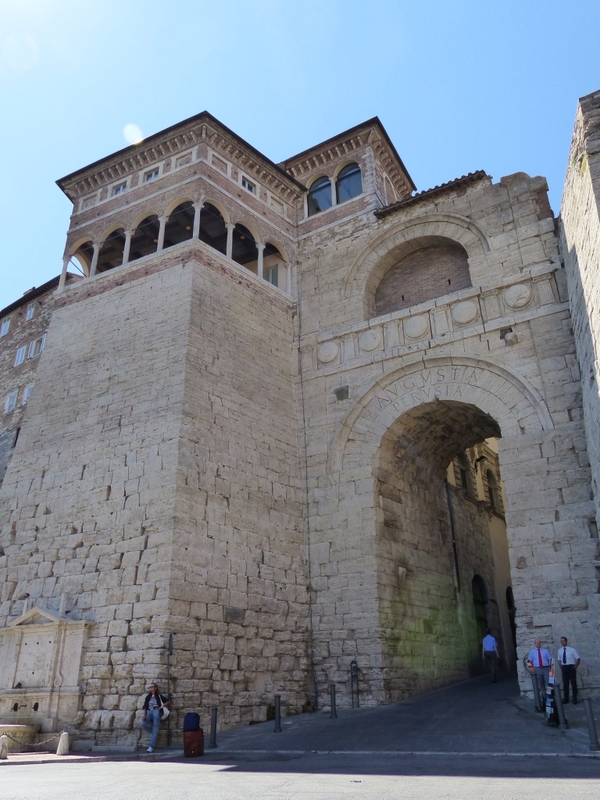 Next we went to the Etruscan Gate and Capella di San Severo. Near the Etruscan Gate we went to an old well. 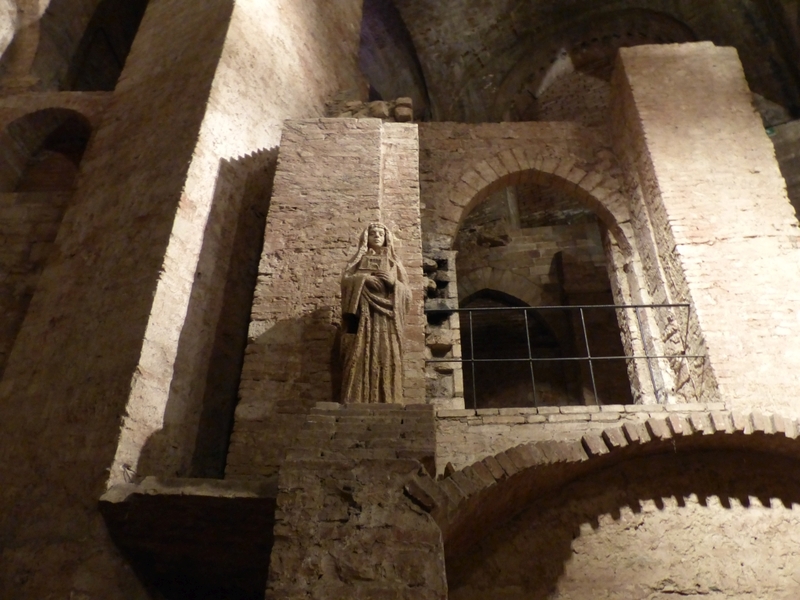 Finding it takes longer than the visit itself... Then we continued to Rocca Paolina, an underground city. Amazing! 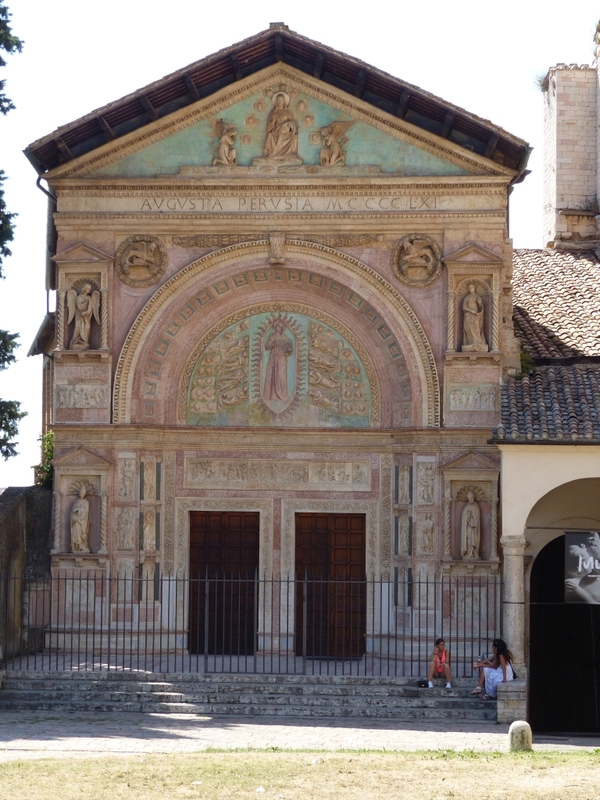 We walked to the Chiesa San Pietro, but that was closed. We walked back to the center and had lunch and a beer while enjoying several bands playing live music. Around 3pm we left and did a small tour we received from Rebecca, around some fountains. We ended our trip to Perugia with ice cream at Grom. Around 5.15 we arrived at the hotel. We went for a swim. We went for dinner in Citta di Castella. We went to Trattoria, famous for its truffel dishes. Back the hotel we had wine outside and made plans for the route to and in Sienna. As we wanted to see a lot of the Sienna sights as well, we got up early. Again a delicious breakfast with several types of bread and cakes. Rebecca is a real chef! By 9.20 we were on the road. 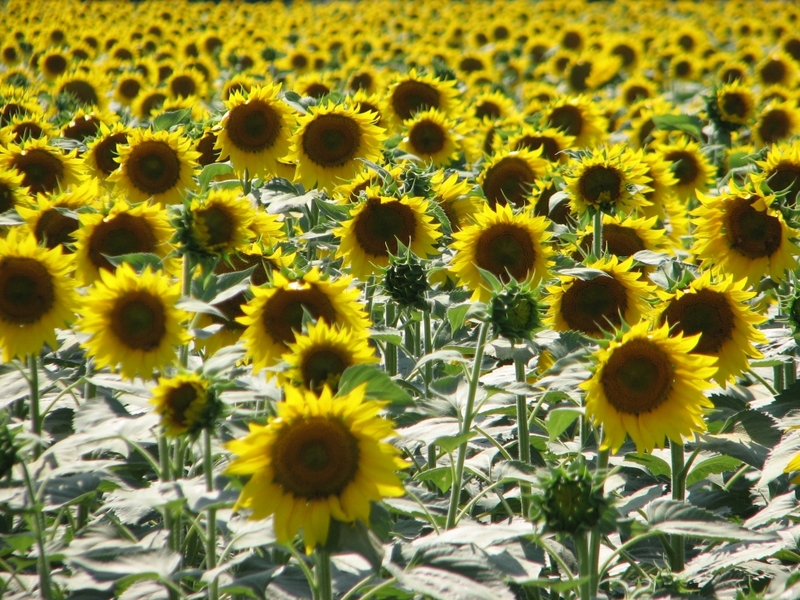 We passed a lot of fields with sunflowers. 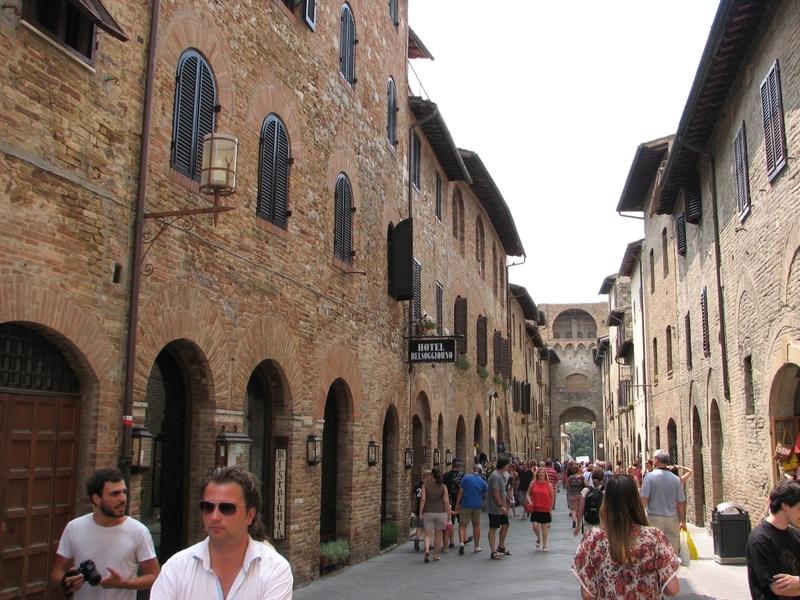 Around 11 we arrived at the hotel in Sienna. We could park for free in front of the hotel as it was a Sunday. As our room had not yet been prepared, we immediately went into the city. First stop was Piazza del Campo. 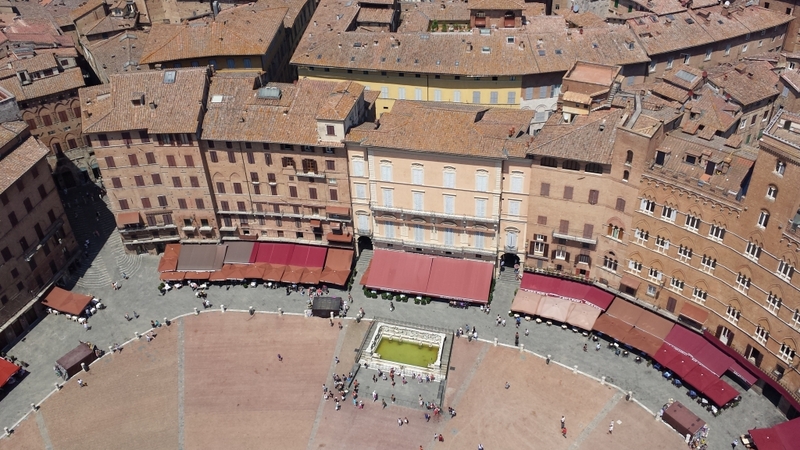 THE square of Sienna. 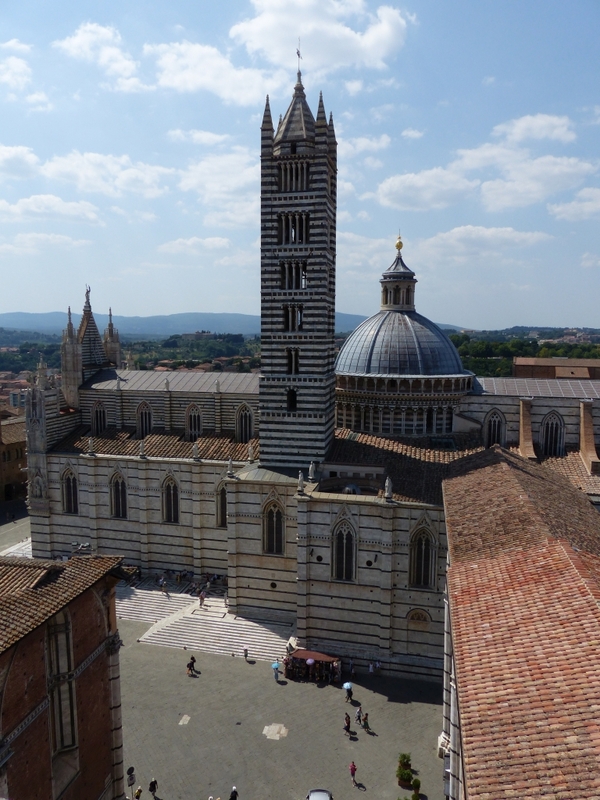 We bought a ticket to climb the bell tower (Torre del Magnia) - 387 steps in the heat... But we were rewarded with a great view of the city. 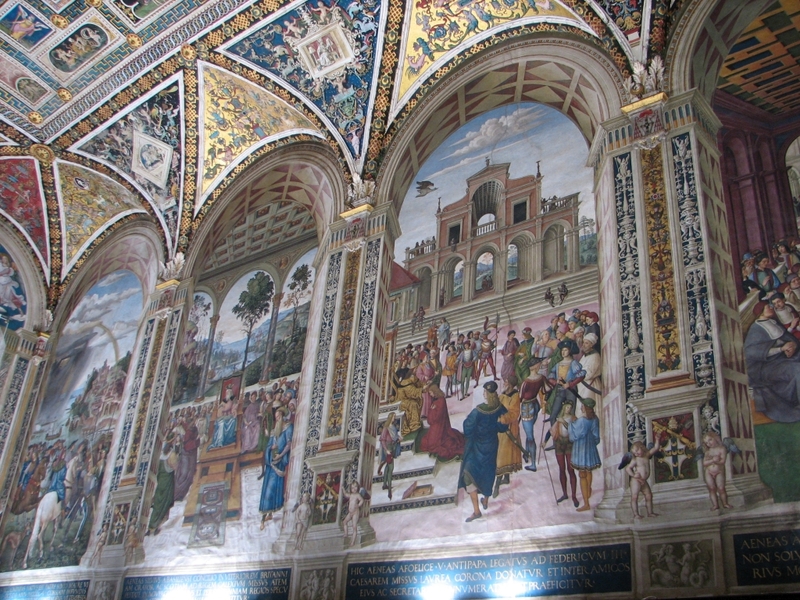 Next we went to see the Duomo and Libreria Piccolomini; both very impressive. 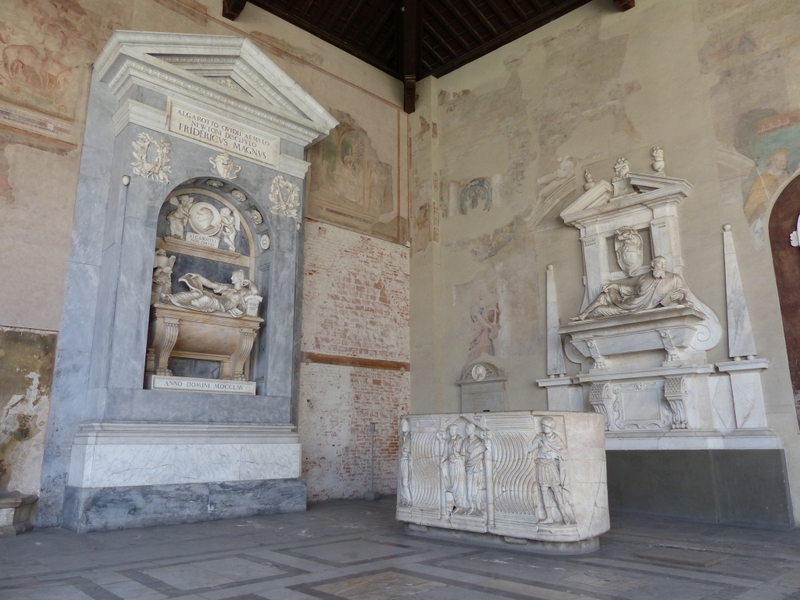 Then we went to the Battistero di San Giovanni and the crypt (only discovered in 1999). 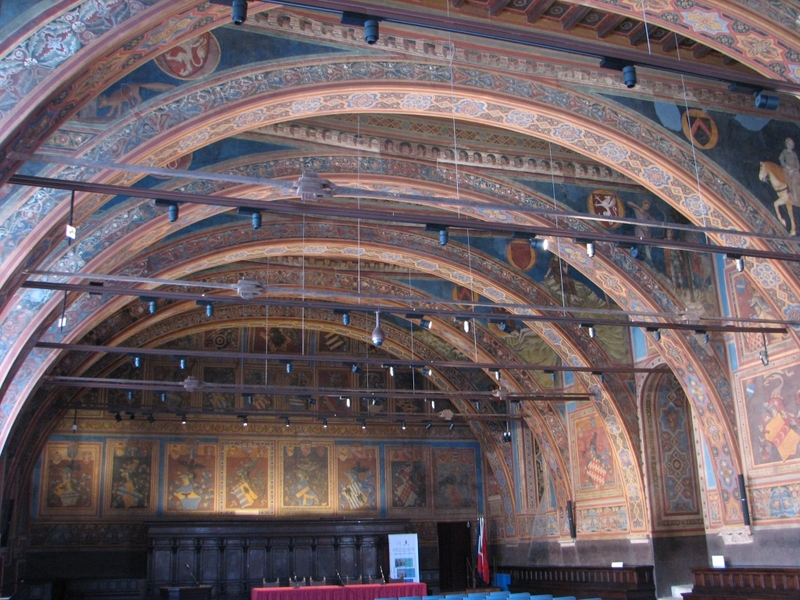 After lunch we went to Ospedale Santa Maria della Scala, the oldest hospital in Europe. 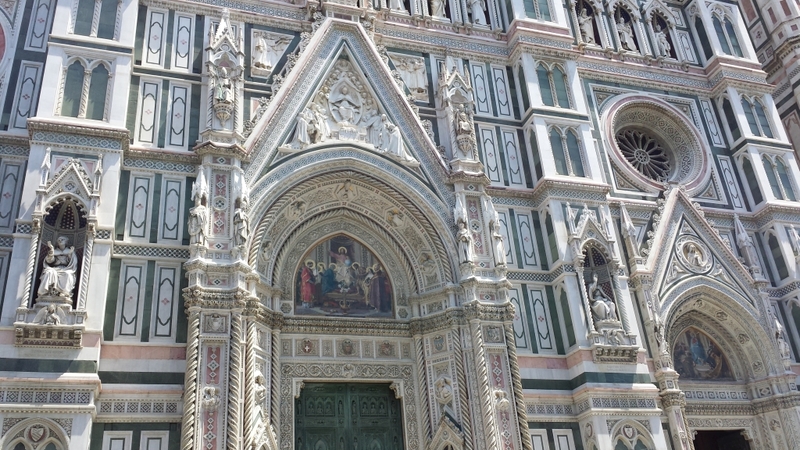 Next we went to the Musea dell'Opera dell Duomo. Also there we went up the towerto see the view of the city. 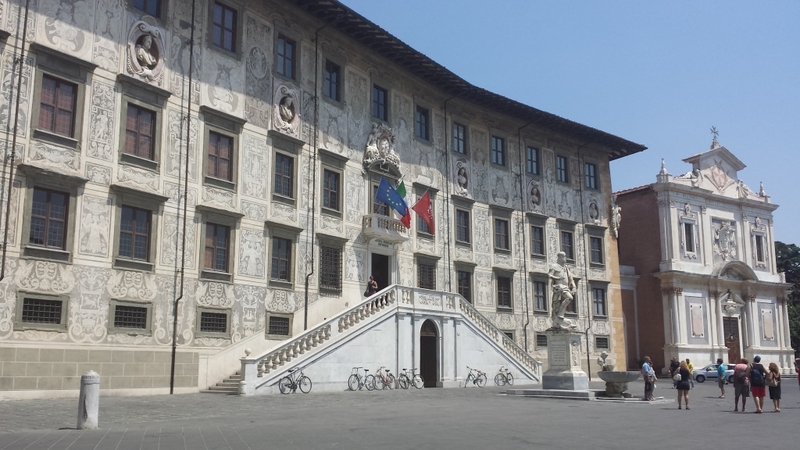 After a beer outside the museum we wentto the last highlight: Museo Civico in the Palazzo Publico. We had ice cream at Grom before returning to the hotel. After a shower we went for dinner around 7.30. 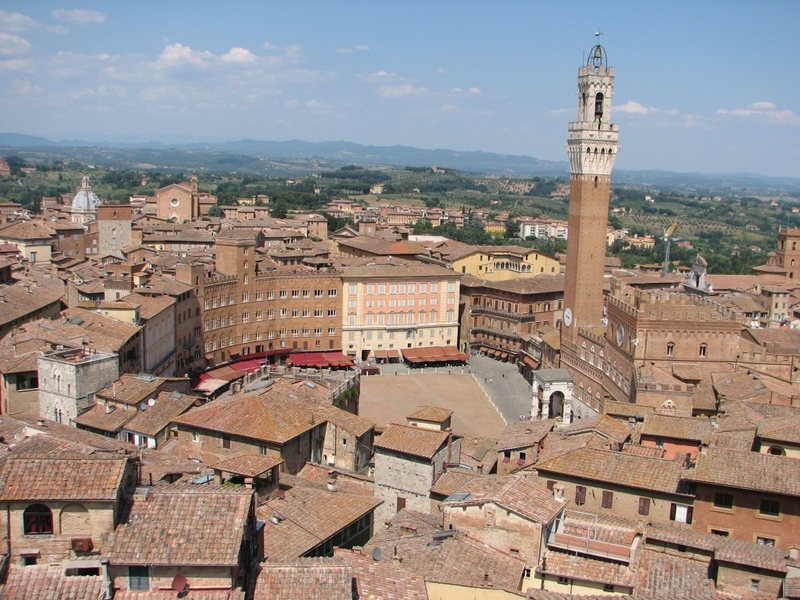 The restaurants at Piazza del Campo were fully booked, so we walked in the direction of the Duomo and had a very good dinner at the Taverna del Capitano. After a quick breakfast in our room, we checked out around 9.15. 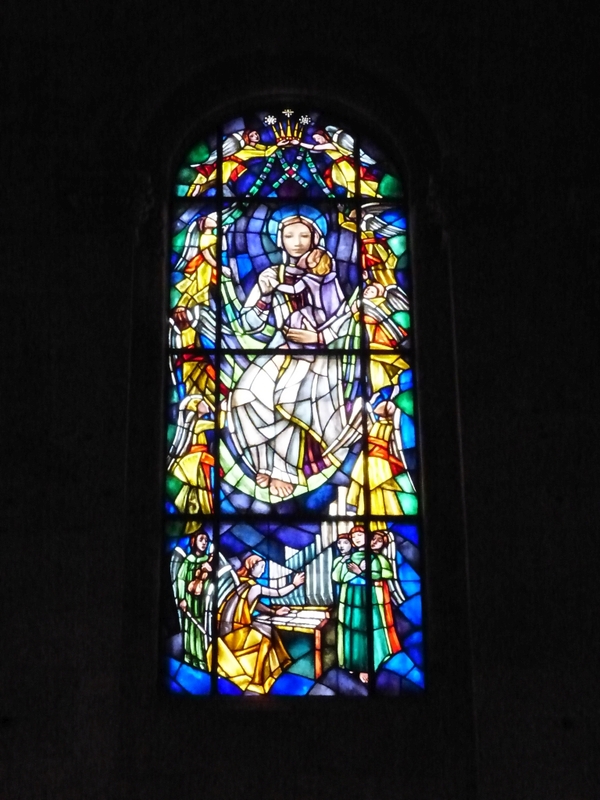 We took the scenic route to Florence and made stops on the way in Castellina in Chianti to visit an Etruscan grave and Panzano in Chianti to see the Chiesa Santa Maria Assunta. We dropped of the car and took the shuttle bus to the airport where we arrived around 2pm. We took off around 4.30 and eventually arrived back home around 9pm.